Matt Groening doesn’t need to work anymore, The Simpsons is one of those insane, money generating properties that will keep Groening, his family and their kids afloat for generations to come. Still, I’m glad that he still has drive to create something new after this long. The Simpsons is an integral cultural touchstone for most people of my age, and Futurama was one of my favourite shows during its initial run. 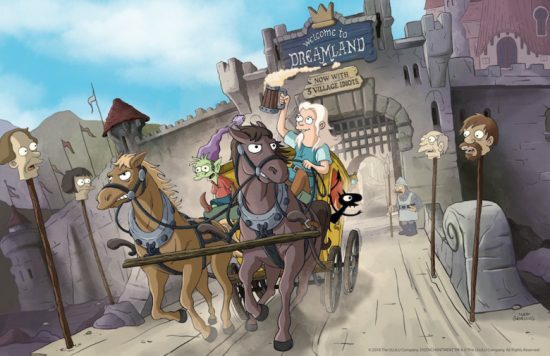 Disenchantment is Groening’s newest show, billed as Futurama crossed with Game of Thrones, although comparisons to either of those shows might be giving Disenchantment a little too much credit. A Netflix Original show, from not just Groening, but familiar names such as David X. Cohen and Josh Weinstein. 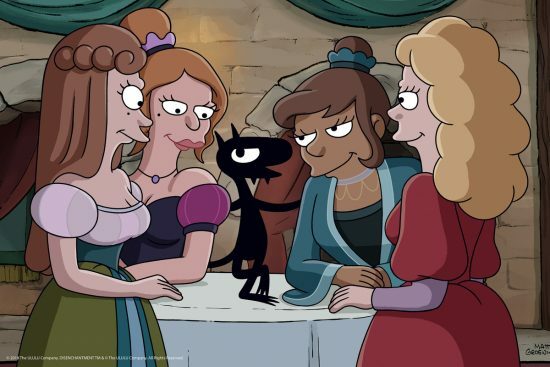 It certainly has the pedigree when it comes to the names that made Groening’s other shows a success, including a number of familiar cast from Futurama such as John DiMaggio, Tress MacNeille and Billy West. On paper, this should be a show that blows the doors off. Sadly, it doesn’t quite live up to expectation. 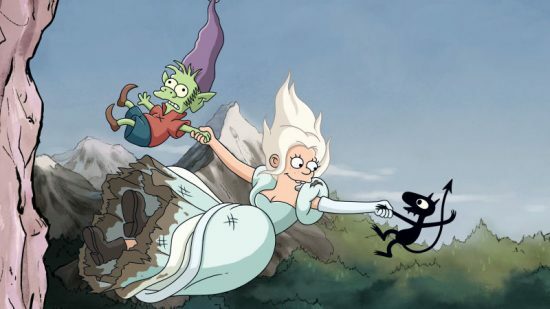 Disenchantment stars Abbi Jacobson as Princess Tiabeanie, known by pretty much everyone in the show as just Bean. 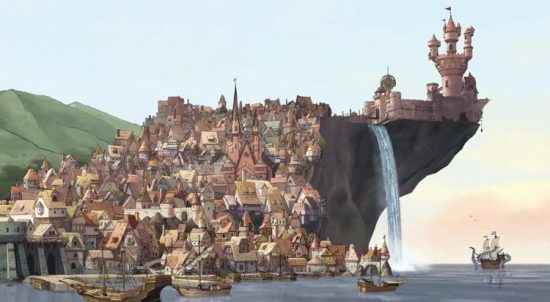 She’s the Princess of the fantasy city of Dreamland, a castle and town located high on a cliffside. Despite being a Princess, she shares more characteristics with Futurama’s Bender than the traditional princess you’d see in a Disney classic. In her misadventures, she is accompanied by Elfo; played by Nat Faxon. An elf of the Santa’s workshop variety rather than the elegant race of Tolkien fame. A badass by elf standards, but a naive idiot by everyone else’s. The final member of this trio is Luci (Eric Andre), a tiny demon sent to Bean in order to loosen her inhibitions and bring out the worse aspects of her character. Doing it with a detached dry wit. While these three make up the main cast, there are a ton of supporting characters including her father; King Zod, and his bumbling court. Funnily enough all of Zod and his hangers on are voiced by the primary cast of Futurama. In which might have been a subtle torch passing move. The first episode introduces Bean as young woman who would rather spend her time drinking at the pub than doing anything remotely pricessey. It shows how she meets Elfo and Luci while trying to dodge an arranged wedding. The episode is a good indication how the series decides to forge forward. It teases the idea of taking on medieval and fantasy tropes with the more modern attitudes of the cast. However, it always stops short before actually making any statement or having any kind of message. Instead, making a sharp turn into toilet humour. From here, the series wears in a groove of established norms. A good chunk of the episodes have very “sitcom” structure. Like Futurama before it, centring around telling mundane stories with a fantastical setting. Despite the sitcom wrappings though, episodes do carry from one to another. There are running gags and major plot lines that reach a head by the time the series ends. For the majority of the series though, it feels like they’re throw-away gags and you don’t come to appreciate some aspects of the show until it eventually pays off. The problem is with how it gets there. Where Disenchament fails, it feels like it lacks heart. Something both The Simpsons and Futurama excelled in. Sure, those series are filled with jerk asses, but there was a lesson to be learned by the end. 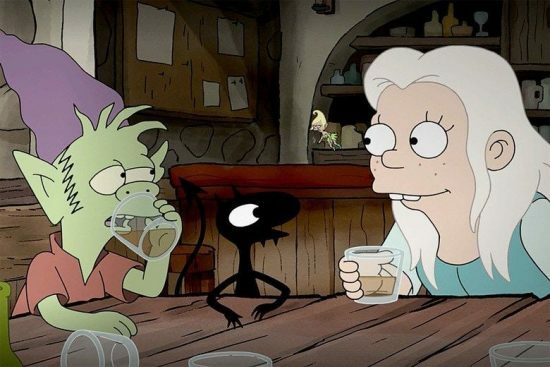 In Disenchantment, all of the characters are assholes and it doesn’t feel earned. Bean is the heart of the show, but is only a good person when it suits her, and is pretty flakey she does so. Elfo is a bit of a weasel and an unconsciously habitual liar. And Luci is a literal demon. I get the impression that the show is trying to defy its own tropes by never really having characters learn their lesson at the end of the episode. Or by making you think they’re going to learn something, only to double down and make things even worse. But it never feels satisfying because the show never really does a good enough job endearing the cast to me. Characters like Zod are berated for being a bad father to Bean, and until the final two episodes, he seems to get off scott free with his crappy treatment of her. There is a turn and resolution to the storyline between the two, but it feels less impactful when neither character has seemed to want to build bridges until they suddenly did. It’s the same with most of the other cast. It’s not until the final handful of episodes where events suddenly feel like they have weight and meaning. It’s a little jarring, early on the series just seems like a series of wacky hijinks, but then suddenly, things feel more real. It’s at this point where the series becomes less of a sitcom and leans more into the fantasy drama. My issue is that it takes too long to get to this point, while also never really giving an indication that it intends to do this. It’s one of the downsides to this show looking like it does and having the names attached to it that it does. There is some expectation of pedigree when it comes to comparing this to both The Simpsons and Futurama, regardless of how those two series ended up in their later years. It’s an unfair comparison honestly, but it’s a shadow this show will not be able to wriggle its way from underneath, maybe never. I brought this up a couple of times, but I did actually enjoy the show by the time the final three episodes rolled around. While most things up until now felt like disassociated sitcom episodes, they did introduce characters and aspects of the world that end up paying off by the time we get to the season finale. It pays off in a way that I didn’t expect, given how I was feeling up until this point about the show. But when things come together, and events start to feel like they actually matter. I suddenly found myself invested. What I didn’t know when watching the series, is that the series is split into two parts. One’s out now, and the other is coming out some time in the future. Thing is, there’s no indication from Netflix that this is the case. As a consequence the series just ends pretty abruptly with so much as a “to be continued”. It’s not just that it ends on a cliff hanger, it just ends in a way that makes you think that there is another episode to watch right away. It feels like it ends half way through an episode. 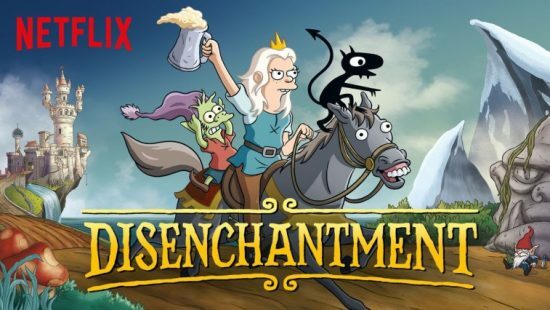 Disenchantment is okay. Considering the personal pedigree I hold the creators of the show to, I had expected more of this show that what it ended up being. It feels like a show with an identity crisis. It couldn’t make up its mind between being a family sitcom or a fantasy drama. Nor would it decide if it was inspired by the the whimsical fantasy of old or the more modern takes seen in things like Game of Thrones. As a result it ends up being really uneven and tonally inconsistent. It may have ended strongly and cockteasingly enough that I do want to see where it goes, but it only got to that point because I had to endure several mediocre episodes leading up to it. Ultimately, I wouldn’t recommend the show. It’s not bad, by any means. It just could have been something more. 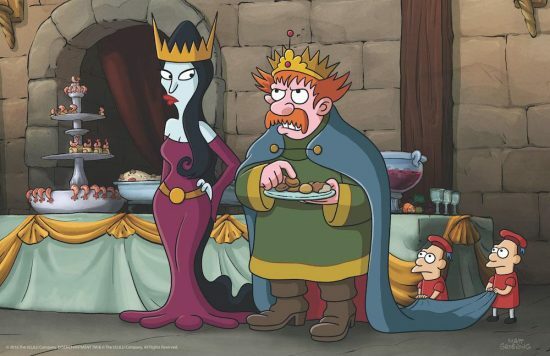 Posted on September 21, 2018 September 21, 2018 by WooderonPosted in My Thoughts on:, TelevisionTagged animation, billy west, disenchantment, elfo, Fantasy, futurama, game of thrones, john dimaggio, luci, matt groening, Netflix, princess bean, the simpsons, tress macneille. Previous Previous post: Destiny’s Gambit mode has a Sleeper Simulant Problem.